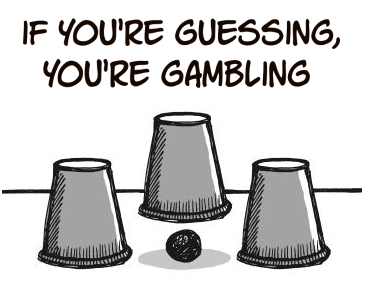 You are here: Home / Blog / Money Management / Is Trading really Risky like Gambling? At first glance, trading appears to be very similar to why gambling, which is why many people deem it to be intrinsically risky, with the high possibility of huge loss. However, while there are some similarities, there is actually a major difference between these two activities. Trading and gambling both involve a certain element of luck and skill, as well as probabilities and uncertainties. Both present the opportunity to make huge amounts of money in a short period of time, and vice versa. That is why both pursuits require good money management skills and strong psychology. However, there is one big difference – the edge. Whether you are trading or gambling depends on whether you have the edge. Simply put, this refers to whether probability is on your side. In trading, doing your analysis and taking a calculated risk tilts the probability in your favour, while in gambling, such as in a casino, the odds are always against you. Before I move on, let me explain the law of large numbers. In statistics, this law states that the larger your sample size (the number of times you trade or gamble), the closer your outcome will be to the expected outcome. If you have the edge, your expected outcome is positive, hence in trading it makes sense to spread out your money over many trades. In gambling, since you do not have the edge, your best bet is to take single large bets, and quit the moment you’re up, but this is also a quick way to lose your capital. The risk involved is not just the activity itself, but rather the expertise and experience of the person doing it. Professional poker players (who are not gamblers) win because they do not play by luck (gambling), instead they use a system that gives them an edge over other players in the long run. The reason why people lose big in trading is because they take single large bets instead of many small bets, and they trade without a method or system which gives them an edge. This is why position-sizing, capital allocation and risk management are such essential concepts in trading. Are you making decisions or just guessing? Some people have asked: Is it possible to make money if one’s hitrate is less than 50%? The answer is yes. If one makes more money when one wins as compared to one’s losses when one loses. This is the idea of the reward/risk ratio, which calculates the upside vs. the downside of every trade. In fact, there are quite a few profitable systems that have hitrates of less than 50%. In conclusion, the greatest risk is not trading or gambling, but rather the player. Emotions, such as greed and hope, tend to cloud better judgment even when one should know better. Most traders tend to see only the upside in stocks, and not the downside, hence they sell quickly once they see a profit, but hold on to losses in hope that these would turn around. This is the main reason why many traders who have the edge are still unable to grow their accounts.